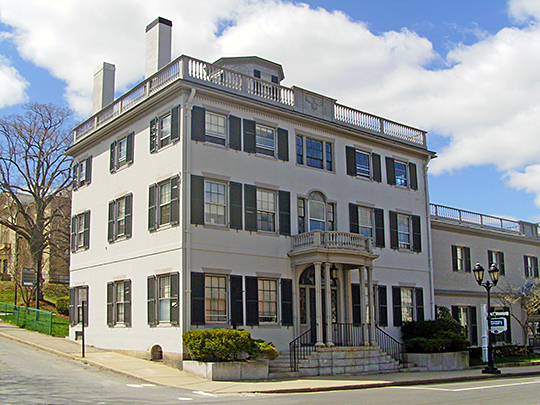 Plymouth Town Hall is located at 11 Lincoln Street, Plymouth, MA 02360; phone: 508-747-1620. Photo: The Bartlett-Russell-Hedge House, ca. 1803, 2 Court Street, Plymouth, Massachusetts. Listed on the National Register of Historic Places in 1976. Photographed by User:Magicpiano (own work), 2010, [cc-by-3.0 (creativecommons.org/licenses/by/3.0)], via Wikimedia Commons, accessed April, 2013. In the year 1620, the 'Mayflower,' bound for Virginia, was blown far north of her course and cast among the roaring breakers and dangerous shoals of Cape Cod. It anchored in what today is Provincetown Harbor, and finding that terrain unfriendly, about a month later the Pilgrims set sail for the mainland. They were tossed about by a storm and nearly wrecked, but at nightfall they landed on an island in Plymouth Harbor. On December 21 (new style calendar), 1620, with seventeen men, occurred the 'Landing of the Pilgrims' at their first settlement. The legends surrounding the landing are picturesque, but seem to have little basis in substantiated fact. The majority of the Pilgrims, indeed, remained aboard ship for the better part of a month until shelters could be erected ashore. Snow covered the decks of the vessel; exposure and unsanitary conditions increased, and sickness grew apace. Scurvy and ship fever raged, and juniper was burned aboard to dispel the noisome smells of death. Sometimes two or three died in a single day. By March nearly half the company was dead. There was never actual starvation, for berries, wild fowl, and shellfish abounded; but great disaster befell the little community in their second year when the ship 'Fortune,' carrying over their entire yield of furs and produce, was captured by the French as a prize. Early difficulties were not all material; the more important ones were spiritual. To the horror of the community, it was discovered that [Reverend John] Lyford, their pastor, had been exiled from England as unfit for the ministry. Moreover, Lyford was soon convicted at court of writing 'slanderous letters,' disparaging Plymouth Colony and the country. This gave great pain to the London adventurers, who, to increase their revenues, depended on finding persons in England willing to go as colonists. It also damaged the pride of the Pilgrim Fathers beyond repair. Later Thomas Morton recounted the manner of Lyford's deportation : His exile was arranged after a solomne invention in this manner. A lane of musketeers was made and hee compelled in scorne to passe along betweene, and to receave a bob upon the bumme by every musketier. And then aboard a shallop and so conveyed to Wessaguscus shore. Finally, the congregation secured the services of one Reverend Smith, a pastor who had been discarded by the Salem Colony; though it is related that he too was of odd temperament, even supposed by some to be insane. Now Thomas Morton, a companion of Captain Wollaston, set up a rival trading colony near-by at what is now Wollaston, in Quincy. The staid Pilgrims were duly horrified by the 'Merrymount' revels, but Morton flourished in his wickedness like the green bay tree. He sold rum and guns; and with these to be got in exchange for their furs, the Indians practically refused to take any amount of the Plymouth wampum and trinkets. At last, however, Miles Standish proceeded to Merrymount, seized Morton prisoner, and deported him to England. In spite of all such zeal, by 1642 the piety among the 'Pure and Unspottyd Lambs of the Lord' of Plymouth seemed at a low ebb, and severe measures were taken to combat the powers of evil. For nearly fifty years there were but forty-eight freemen, all of whom had to be church members. They controlled all the affairs of the town, and it would have been hardly human if occasionally piety had not been made the handmaid of profit. At the end of a century after the landing, Plymouth had a population of two thousand, comfortably supported by agriculture, navigation, and commerce. Already, too, settlers from the mother town had founded or were founding other prosperous communities in the environs, extending as far as Eastham on Cape Cod and the present city of Fall River near the Rhode Island Line. Whale-fishing, begun about 1690 and abandoned about 1840, occupied many of these daughter towns, notably Wareham and the Cape Cod towns. By the turn of the nineteenth century, stagecoaches ran from Boston to Plymouth, and thence in various directions. Alongside the wharves were seventy-six ships, brigs, and schooners. By 1830 the population was nearly five thousand. A hundred ships engaged in coast-wise trade and fishing, especially for cod and mackerel. Four vessels went whaling. The town had forty ships, five iron mills, two cotton mills, and three ropeworks. Among these was the Plymouth Cordage Company, which in the 1930s was one of the largest in the world. Honor was brought to the town by one of its most distinguished citizens, Dr. Charles Jackson, who was awarded twenty-five hundred francs by the French Academy of Science as the co-discoverer of 'etherization'.